We have original science fiction by Stephen S. Power (“Fade to Red”) and Mary Anne Mohanraj (“Plea”), along with SF reprints by Karen Joy Fowler (“Game Night at the Fox and Goose”) and Fran Wilde (“A Moment of Gravity, Circumscribed”). Plus, we have original fantasy by Jeremiah Tolbert (“The Cavern of the Screaming Eyes”) and Kat Howard (“The Key to St. Medusa’s”), and fantasy reprints by Aliette de Bodard (“The Dragon's Tears”) and Will Kaufman (“October's Son”). All that, and of course we also have our usual assortment of author spotlights, along with our book and media review columns. 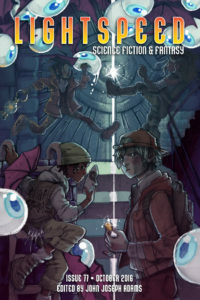 For our ebook readers, we also have an ebook-exclusive reprint of the novella “The Stars Do Not Lie,” by Jay Lake, and an excerpt from Will McIntosh's new novel, Faller.